One week down and who'd have thunk it... Had a meeting with a Staffing Agency downtown today at Mathys Studio Staffing, we will see where and if that leads anywhere. Went to a HUGE Goodwill on Cornell, well, at least it looked big from the outside. Not really interested in purchasing anything at this point anyway so it was more of a meet and greet. Nice to know you GW. After driving for 30 minutes to try and finds any Indian restaurant to eat at, I decided upon Pizzicatos, which is Pizza but would do. 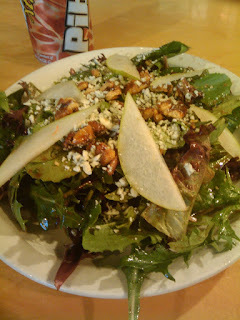 I had the ARUGULA PEAR salad with baby lettuces, candied walnuts, Gorgonzola & balsamic vinaigrette. 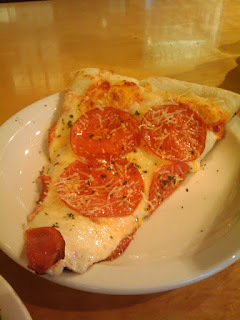 All this healthiness came with a side of BIG F*CKING PIZZA! and a Mr. Pibb to warsh it down. Speaking of down, downtown is becoming easier to navigate as I am learning what highways take me where and what major roads run north/south and east/west. Once that is learned one may get anywhere within a city. Provided that is designed somewhat logical (BOSTON, I'm looking at you!). 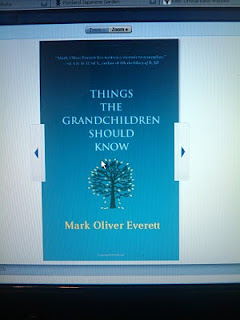 I've been trying to find a reasonable copy of "Things Your Grandchildren Should Know" by Mark Oliver Everette. E as he is better known is the lead singer the THE EELS. I have heard this book is pretty darn good. E has had nothing but tragedy in his life as any amazing musician should, right? He found his father dead, his mother committed suicide and his sister followed shortly behind. E's life is thick with more tragic irony than a clowns funeral.